Happy Wheels is a ragdoll physics-based, browser game created by Jim Bonacci in 2010. The game features severalplayable characters who use different, sometimes atypical vehicles to traverse the game’s levels. The game is best known for its graphic violence and the amount of user-generated content its players produce on a regular basis. Happy Wheels‘ tagline is “Choose your inadequately prepared racer, and ignore severe consequences in your desperate search for victory!” The actual mechanics of gameplay vary because of character choice and level design. However, the player always faces to the right and their vehicles can move forward and backward. Characters can also be ejected from their vehicles, however after leaving their vehicle, they lack the ability to stand upright or walk. The goal of the game also differs depending on the level. In some levels, the goal to reach a designated finish line. However, some levels have no finish lines, and have alternative goals (or no goals at all), such as ones requiring that the player attempt to kill a target. 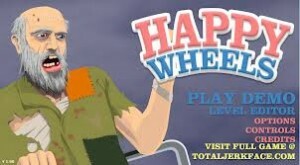 Reviewers have noted that Happy Wheels exhibits graphic violence in its gameplay. For instance, players can bedecapitated, shot, or crushed by different obstacles. Loss of limb and animated blood loss are also graphic elements. Players also have the choice to upload replays of their level attempts. Replays can be then be viewed and rated by other players. Happy Wheels contains a built in level editor, and allows players to create custom levels of their own. Users are given a large variety of tools and objects to build their levels. Users are able to submit their maps, whereupon they can be played by all users. Indie game developer Jim Bonacci, who was largely the programmer and artist for the game, began work on the game in 2006. Bonacci has said that his inspiration for the game came from other ragdoll physics-based games in the Flash community;his friend and former boss, Alec Cove, had made a verlet physics engine for flash. It always bothered me when…you’d fall off your vehicle and harmlessly bounce around. In other cases, you would have the same canned animation over and over. I’m not sure if it was a lack of detail or concern on the part of the developer, but the consequences of your in-game actions were often improperly illustrated. For me, half of the fun of playing a game that imitates life (sort of), is making mistakes and seeing the end result. Bonnaci also noted that because gameplay would often involve the player dying repeatedly, he put a great deal of effort into making that part of the game enjoyable. The full version of Happy Wheels is only available on Bonacci’s original website,and demo versions of the game are licensed to other websites. These demo versions only include featured maps and select characters. Currently, the only other person who helps Bonacci work on the game is Jason Schymick. Happy Wheels has received generally positive reviews. It has been recommended by GameSetWatch.comand considered one of the “Best Free Games” by IGN. Its level editor and amount of user-generated content have received praise from reviewers.